UPDATE: Hi Techies, In this post we will discuss Samsung Galaxy On5 Specifications, Price in India, Features & More. 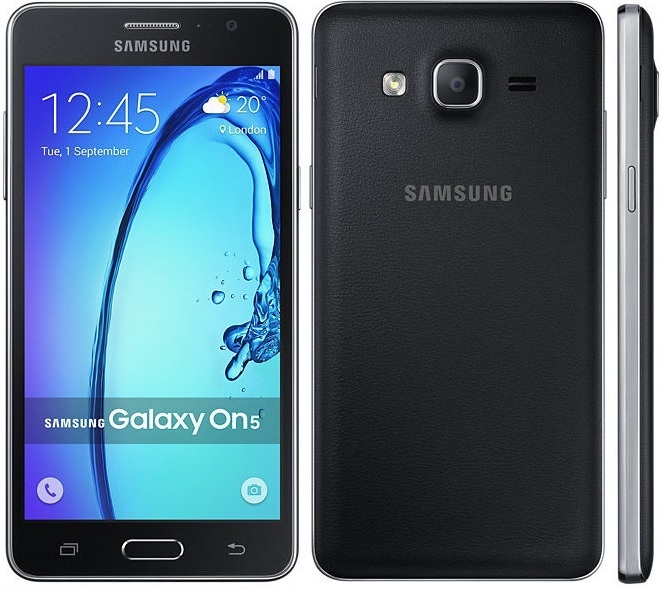 The Samsung Galaxy On5 Sports a 1.3 GHz Quad Core CPU, 1.5 GB Ram, 5 Inch H.D display. In terms of imaging, it has a 8 MP Rear camera with LED Flash & 5 MP Front camera. Talking about the design, it has a plastic body & a faux leather finish at the back. After looking at the device specifications, we can conclude that this phone will be capable of handling day to day task with ease. Rest we will will tell you once the device is out. 5 Inch H.D Display. (~288 ppi pixel density). DISPLAY 5 Inch HD Display. Resolution 720 x 1280 pixels (~288 p.p.i pixel density). FEATURES Quad Core CPU. | 4 G Support. | H.D Display. Unfortunately there is no official price & launch date is confirmed as of now. But we can expect it to launch in November with a expected price of around 8,999 Rupees in India. The Galaxy On5 is now launched in India for a price tag of 8990 Rupees. (Our Expected price held true for the device). It will be exclusively available at Flipkart. (To go on sale soon).